Ever since a V8 was first dropped into a Corvette’s engine bay (at the start of the 1955 model year), the Corvette has provided exceptional performance for sports car buyers year after year. These buyers always knew, even in the darkest days of performance, that V8 powered nirvana was always available at a Chevrolet dealership in the form of the (2-seater) Corvette. Sixty years ago the first (1953) Corvette rolled off the assembly line, today in its sixth generation (C6) form, it’s more popular than ever. With the release of the C7 (seventh generation) only a short time away, the anticipation of Corvette fans is growing. Reason for the uneasiness is that each Corvette generation is noticeably different than the others and each generation has its legion of fans. Some Corvette enthusiasts like all generations and others only one or two generations. So for a particular Corvette fan it’s anyone’s guess if he or she will like the upcoming seventh generation. When it comes to the accessing the different generations, if one has to go by longevity as a deciding factor for which generation was the most popular – than the third generation (C3) 1968-1982 would be the hands down winner. No generation has spanned as many years as the C3 which covered fifteen model years. Even the original run of the Pontiac GTO (1964-1974) only last eleven years. Though the C3 Corvette had a little refreshing and updating from time-to-time, the overall exterior and interior designs remained basically the same over the entire fifteen years. The 1968 Corvette was so ahead of its time styling-wise when it was first released, Chevrolet wasn’t in any rush to replace it with a fourth generation. After-all GM during the 1970s was spending its large capital on meeting federal emissions regulations and the EPA’s Corporate Average Fuel Economy (CAFE) standards. So money was instead spent on mild updates to the C3 – saving GM much needed funds since it could delay far into the future development of the C4. To Chevrolet’s credit the mild updates did an excellent job of keeping the Corvette current. Even in the C3’s last year, the 1982 Corvette still looked current and not dated by 1982 standards. And even today the 1982 Corvette still looks modern – now that’s saying something. Chevrolet a few years beforehand had big success with the 1978 Corvette Indy Pace Car edition and the 1978 Corvette 25th Anniversary edition, so it decided to end the C3 run in a similar fashion. It offered for 1982 a special limited edition Corvette called the "Collector Edition" – a total of 6,759 were produced. There was no mistaking the Collector Edition, it had enough unique items not available on any other 1982 Corvette to make it worth the high base price of $22,538 which made it the first Corvette to surpass the $20,000 price tag mark. 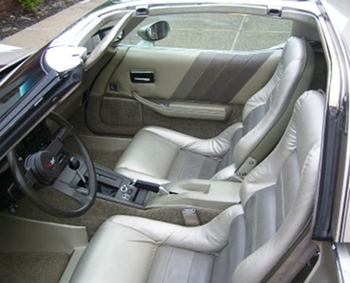 The unique items were a silver-beige (paint code 59) exterior color, an opening rear glass hatch (all other 82 Corvettes had fixed glass), a silver leather interior accented by multi-color gray trim, 15×8 inch finned aluminum wheels, brown graduated decals and stripping throughout the exterior, and bronze tinted glass T-tops. Also part of the package was standard Corvette Collector Edition emblems – one on the front hood, another on the rear gas cap, and another on the steering wheel hub. The 1982 Corvette as previously mentioned did not look dated even with a body style that was fifteen model years old. The last slight update to the body style was done for the 1980 model year where the front and rear both had attractive updates. The 1982 had all the familiar humps and bumps found on every other C3 Corvette. The C3’s distinctive styling was taken right from the 1965 Mako Shark II show car which first made an appearance at the 1965 New York Auto Show. The 1982 Corvette Collector Edition was in a way a tribute to the Mako Shark II – since it just like the Mako Shark II had a two tone paint job that mimicked a shark. The Collector Edition was a lighter color but the graduated brownish decals on the hood and along the lower beltline gave onlookers the impression that it was a custom paint job since the decals looked like different shades of paint instead of a decal. Chevrolet really had to be commended on the finished product since it was such a distinctive exterior – like nothing seen before or after its release. Also most people glancing at the car for the first time won’t see the dark brown pinstripe decals in just about ever crease and curve on the Collector Edition’s body. When you add up the number of pinstripe decals along with the graduated decals, the total comes to 30 separate decals. Even some owners are surprised at the amount of decals when it comes time for a full restoration or just an exterior repaint. Back in the day if one needed replacement decals, they were sold separately through GM’s dealership parts network which was costly and time consuming hunting down all the different pieces which came in separate boxes. Fortunately Phoenix Graphix currently sells a reasonably priced authentic reproduction decal kit. As easy as this kit makes purchasing all the needed decals, a lot of time is still needed to place each of the decals on a repainted and restored car. However the finished product is well worth the time spent. The 1982 Corvette was the end of a cultural icon, the 1968-1982 Corvette was designed by Larry Shinoda who also designed the 1965 Mako Shark II – the design was nothing short of a fine work of art. Even the door handles on all C3s were hidden so they wouldn’t interrupt the C3’s flowing lines. The previously generation – C2 (1963-1967) – was also a work of art and also designed by Larry Shinoda. When 1982 Corvette production came to a close, six months later it was replaced by the 1984 Corvette. The 1984 Corvette was an all new body design – one that was still recognizable as a Corvette – but clearly the allegiance of the Corvette had changed to aerodynamics and no longer about being a work of art. The beautiful sculpted beltline and humps of the C3 were gone and the C4 begin the current wedge shaped design that is still used by the current (C6) 2012 Corvette. 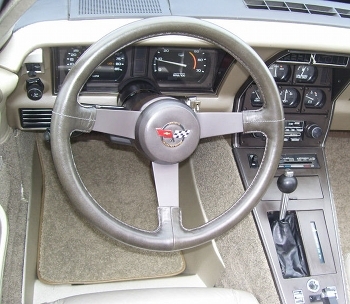 Interesting to note the 1982 Corvette was the first Corvette to receive a 4-speed automatic transmission (GM’s new 200-4R which was introduced in Fall of 1980). The downside was this transmission was mandatory on all 1982 Corvette models including the Collector Edition. No manual transmission option was offered for 1982. The good news about 1982 was that fuel injection was back after a long hiatus (1965 was the last year it had been offered on the Corvette). However this time around it was computer controlled and used a dual throttle-body injector (TBI) setup – each TBI resided on the opposite ends of the aluminum intake manifold. It was reminiscent of Chevrolet’s legendary small-block Cross Ram 302 CID V8 – a very potent racing setup back in the late-1960s. The dual TBI system was called Cross-Fire Injection, it even had a modern version of the Cross Ram’s oval air cleaner assembly. Unfortunately it was 1982, and an all out racing spec small-block V8 wasn’t going to meet EPA emissions regulations and the Corporate Average Fuel Economy standards so Chevrolet did as best as it could by providing an emissions legal small-block 350 CID V8 for the Cross-Fire system. The (L83) Cross-Fire 350 (5.7 liter) V8 had a high performance cam and was tuned in such away to allow the Corvette to have good performance and meet emissions and CAFE standards. In fact with a rating of 200 horsepower and 285 lb-ft of torque it not only was more powerful but also more fuel efficient than the 1981 Corvette’s 190 horsepower and 280 lb-ft of torque (L81) 4-bbl carburetor equipped 350 V8. The L83 Cross-Fire V8 which had a compression ratio of 9.0:1 (high by early-1980s standards) also managed to be the most powerful V8 available in an American car for the 1982 model year. Some of the pundits today like to take swipes at the L83 Cross-Fire V8, they forget or don’t realize that back in the early-1980s, the L83 was as good as it got. And Corvette fans were glad to have it back in 1982. CAFE had killed off large displacement performance V8s during the late-1970s and by the early-1980s the only V8 engines left were anemic small displacement V8s that made 150 horsepower or less. 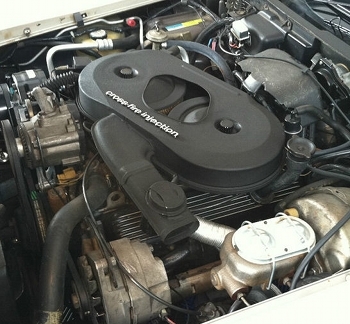 Even the 1982 Mustang GT’s 5.0 liter HO (2-bbl) V8 was rated at only 157 horsepower. The 1982 Corvette went 0-60 mph in about 8.1 seconds and performed the 1/4 mile in 15.9 seconds at 86 mph. This 1/4 mile time made it the fastest production American car for 1982. However the 1982 Mustang GT 5.0 HO was closely nipping at its heels. With the 5.0 liter HO equipped 1982 Mustang GT having an average 0-60 mph time of around 8.1 seconds and a 1/4 mile time of around 16.1 seconds at 87 mph, it was easy to see the battle was quite close. The Corvette had something the Mustang GT didn’t and that was a solenoid controlled ram air induction system that pulled cold air from the area between the rear hood and the windshield and sucked it right into a big hole on the top of the Cross-Fire air filter assembly. The solenoid opened up a flap when the accelerator went past the halfway mark resulting in a sweet bellowing sound that emanated from under the hood – the sound was a reminder of the high powered Corvettes from the golden era. A Cross-Fire Corvette owner may not have had all the ponies under the hood of the super performance Corvettes during the original muscle car period, but the 1982 Corvette still had the soul of one due to the sweet sounding ram air induction system. It’s amazing that the Mustang GT only having 157 horsepower came as close to the 1982 Corvette’s performance. The Mustang GT had the advantage of a SROD 4-speed manual transmission which was mandatory with the 5.0 HO that year. A manual transmission option on the 1982 Corvette would certainly have improved its acceleration times. The Corvette did have a light curb weight of 3,222 lbs versus the Mustang GT which was slightly heavier at 3,319 lbs. 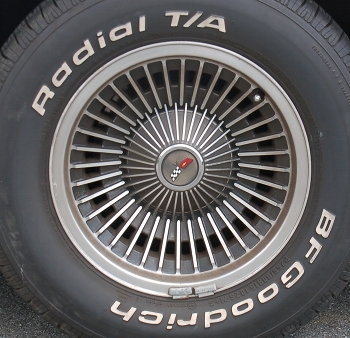 However the Corvette had taller gears with 2.72 rear axle ratio if a 1982 was equipped with the 15×8 inch rally (steel) wheels and if the optional 15×8 inch aluminum wheels were ordered the ratio was a slightly lower 2.87. The Collector Edition came standard with the 2.87 rear axle which was still taller than the Mustang GT’s more performance oriented 3.08 rear axle ratio – another factor for the GT nipping at the Corvette’s heals. The reason for the tall gears in the 1982 Corvette was to keep fuel efficiency up to meet the CAFE regulations. The chassis of the 1982 Corvette Collector Edition may have been dated however it was well-tuned enough to still make it one of the best handling cars in America. Helping in the handling area were a set of fat P255-60-R15 Goodyear Eagle GT performance tires – not only did these large tires stick to the road they also filled up the wheel wells giving the Collector Edition a tough no-nonsense appearance. The Corvette also had four wheel disc brakes and a four wheel independent suspension. 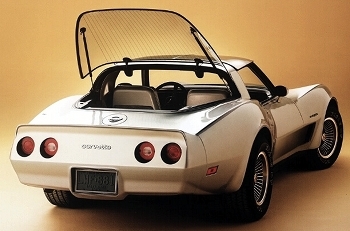 Chevrolet had added to the Corvette an optional new fiberglass rear monoleaf spring in 1981, for 1982 it was standard. The fiberglass monoleaf spring (when compared to the steel leaf spring setup it replaced) was lighter, provided a quieter ride, and improved handling. However for the purist who wanted a heavy duty suspension Chevrolet did offer as an option on any 1982 Corvette (including the Collector Edition) the FE7 (Gymkhana) suspension package. The Gymkhana suspension upgraded the Corvette’s 7/8 inch front anti-sway bar to a 1 1/8 inch anti-sway bar. In the rear it replaced the fiberglass monoleaf with a heavy-duty nine-leaf spring and added a 7/16 inch rear anti-sway bar (no rear anti-sway bar was available for the standard Corvette suspension). The Gymkhana suspension turned the Corvette into a serious handler but it was at a price of a very rough ride unlike the base suspension which offered good handling while still easily absorbing the bumps and road imperfections. The Collector Edition interior was a great match for the beautiful exterior. The same basic layout dated back to 1968, but it really didn’t matter. The layout was perfect for the driver with the speedo and tach located in easy to read places. The other gauges were placed above the radio in the center of the dash. The automatic transmission shifter was well placed and very decorative. Seating position was low and the seats were comfortable with plenty of lateral support. Access in-and-out of the interior cabin was easy for a low 2-seater – the same can’t be said about its successor (the C4). And with lots of standard goodies the Collector Edition came loaded with options. There were even more options available such as a factory CB radio (remember this was when the Dukes of Hazzard was on primetime TV) to chose from. The Collector Edition was just the kind of 2-seater sports car you wanted to take on a long cross-country trip – it was comfortable and fun to drive. Even today the Collector Edition makes a great cruising vehicle. It has most of the modern conveniences found on today’s well-equipped cars, and with a smooth and peppy V8 under the hood along with good handling, driving this thirty year car you sacrifice nothing. In fact driving one on the streets will turn more heads and garner more attention than a new C6. Chevrolet did the C3 a real honor by celebrating its final production year with the low production Collector Edition. 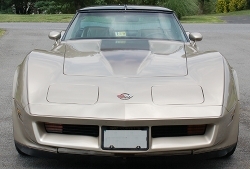 It was the perfect sendoff or retirement party for the C3, after 1982 the Corvette took a new direction – horsepower continued to rise and handling along with braking have greatly improved. However something in today’s new Corvette is missing – one look at the beautiful work of art styling of the 1982 Corvette Collector Edition and you soon realize they don’t make them like this anymore. That’s what makes owning a Collector Edition such a treat.